The term, “Paradise of God” in reference to the Blessed Virgin Mary derives from the homilies of the eighth century Bishop of Constantinople, St. Germain. Traditionally in the Church, the term “paradise” is a Marian symbol closely associated with the Early Church Fathers, such as St. Leo the Great, St. Proclus, St. Andrew of Crete, St. John Damascene, and others, who developed it in their writings. Since the trickery of the serpent and the sin committed by our first parents in the earthly paradise of Eden, resulting in a original sin (yesterday’s Gospel Reading in the Latin Rite), God, in his infinite mercy, desired to fully restore another earthly paradise through the redeeming work of the Incarnate Word. He (God) prepared the “paradise” of the virginal womb of Mary, in which, in the fullness off time (Gal 4:4) came the Divine Son. In the Litany of Loreto, the Blessed Virgin Mary has been petitioned by the faithful to answer their intercessions as the “Gate of Heaven.” Mary’s immaculate and virginal womb brought forth Jesus Christ into the world, she then is truly the Gate of Heaven. In the prophet Ezekiel (44:1-2), it references the mystery of the “closed door” which “shall remain shut; it shall not be opened, and no one shall enter by it, for the Lord, the God of Israel, has entered by it; therefore it shall remain shut.” The most accurate and detailed scriptural exegetical study of this passage points out that this passage is in reference to Mary’s perfect and perpetual virginity – before, during, and ever childbirth. In Mary’s perpetual virginity, it’s a doorway that is always sealed and always to be closed. The image of the Virgin Mother and Infant Christ surrounded by flowers is from the Cistercian Abbey of Heiligenkreuz in Austria. 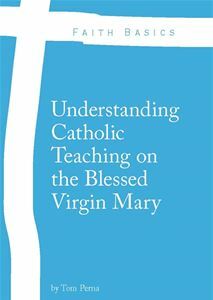 As Saint Ambrose said, “Christ has passed through it, but not opened it.” Pope St. John Paul II has said that Jesus did not violate Mary’s virginity, rather, he sanctified her virginity. Next week we will continue our Old Testament Series in relation to the Blessed Virgin Mary as we examine Marian Symbols used in the Liturgy. O Mary, as the Paradise of God and Gate of Heaven…Pray for Us. Hi Tom, I know you have a strong devotion to Mary. But it seems stronger than your faith in the Scriptures. Things that can’t be proven about Mary are believed by you (yes and the Catholic Church too) Immaculate Conception, forever a virgin, Ascension into heaven, Queen of heaven, co-redemptrix, etc. It makes me sick to think of the false worship accorded to Mary. She was a humble servant of God, just like we should be. I’m not even getting into the apparitions – I don’t know enough. But co-incidentally I got this article right after your email. I hope you will take the time to read it. It equates witch craft with idol worship. You couldn’t be more wrong about my devotion to the Blessed Virgin Mary and my love for the Sacred Scriptures. Your assumptions are poor in facts and reason. I am sorry you think that the devotion we Catholics show to Mary is idol worship. Again, you are completely wrong. Adoration and worship is meant for God and God alone. We don’t worship Mary like we do God. You should take the time to actually investigate and learn what the Catholic Church teaches when it comes to Mary. You said it yourself – you don’t know enough. Making the judgment you did shows how ignorant you truly are when it comes to the teachings of the Catholic Church and teachings we have about the Mother of God. Comparing Mary to Jezebel is a heresy in itself. Stop reading fundamentalist writings and start reading the Doctors of the Church.